A resident is considered economically active if employed, self-employed, unemployed but looking for work and able to start within two weeks, or a full-time student who also has a job. The figures referred to below are for those residents aged 16 and over. Sandwell has a slightly lower rate of economic activity than England & Wales (60.8% of residents compared to 63.3%). 87.7% of Sandwell's economically active are in employment compared to 92.6% nationally, whilst 12.3% of Sandwell's economically active are unemployed, compared to 7.4% in England & Wales. 58.3% of Sandwell's White British population (aged 16 & over) are economically active (EA), compared to 78.7% of Other White residents. 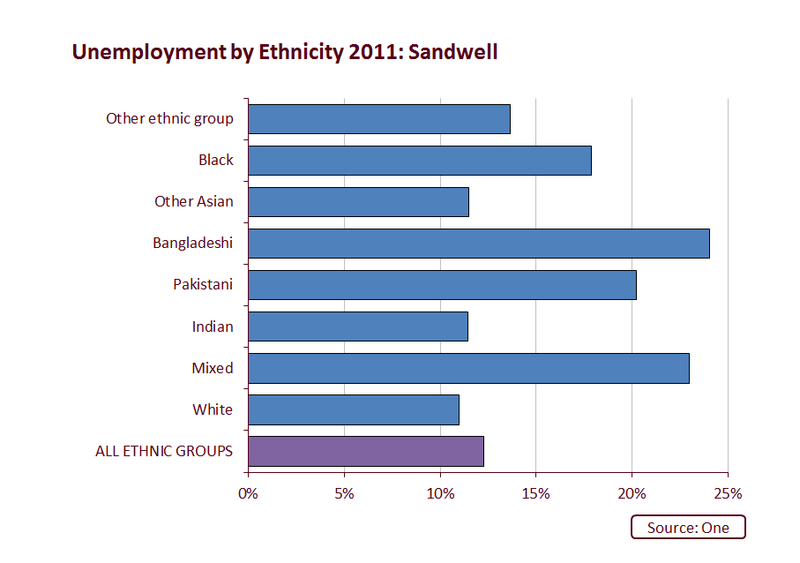 23.0% of Sandwell's EA residents of Mixed origin are unemployed, whilst 17.9% of Black EA are without a job. This compares to only 11.2% of economically active White British residents. 13.7% of Asian economically active residents are self-employed, compared to only 6.2% of EA Black residents. 28.5% of economically inactive (EI) Other White residents are looking after the home or family, compared to only 4.2% of Irish, Gypsy or Irish Traveller EI residents. Considering those EI who are long-term sick or disabled, 15.8% of those of "Other" origins fall into this category, compared to only 10.4% of EI Other White residents. Detailed data by ethnicity and ward can be downloaded as a spreadsheet. Residents were asked to assess their general state of health on a five point scale: very good, good, fair, bad or very bad. Over three-quarters of Sandwell residents (76.7%), described themselves as being in good or very good health, compared with 81.2% in England & Wales. 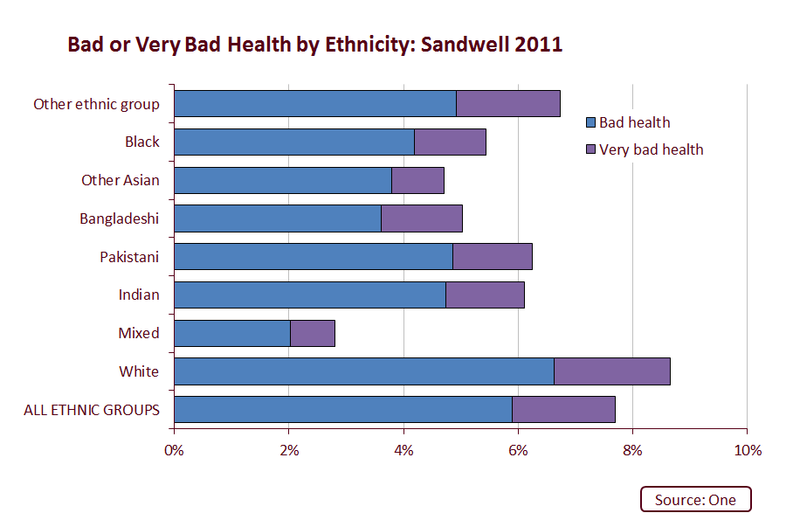 A further 15.6% of Sandwell residents described their health as fair, and the remaining 7.7% described their health as bad or very bad. over 80% of White British residents in Abbey consider their health to be good or very good, compared to only 63.1% in West Bromwich Central. 94.5% of Bangladeshi residents in Bristnall say their health is good or very good, whilst 90% of Indian residents in Princes End say the same. 12.4% of White British residents in West Bromwich Central consider their health to be bad or very bad, and a similar proportion of Bangladeshi residents in Charlemont with Grove Vale report this. Data on general health by ethnicity by ward can be downloaded here.